How do you help a hospital reduce the stress level of patients and their families? One way is to give them a clear idea of when they’ll be seen in the emergency room, or administered their lab tests. Atlantic General Hospital became the first hospital in Maryland to offer a “30-minute ER promise.” Two years later, it also became one of the first in Maryland to display hospital service wait times on its website. 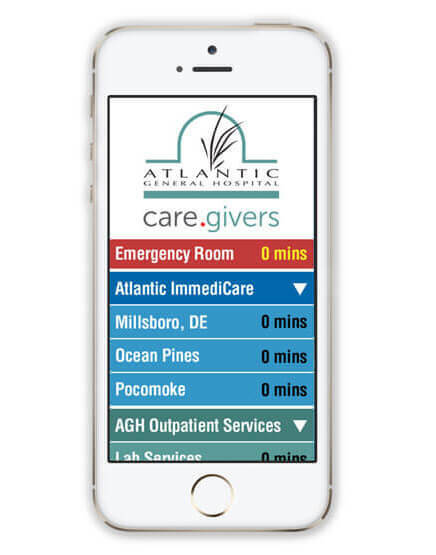 To publicize these great unique tools, we decided to help Atlantic General Hospital build on their technological advantage by developing a mobile application interactive communications tool that takes the convenience of real-time information one step further: allowing people to check the wait times for selected hospital services anywhere, anytime. The phone app displays the times for emergency room, X-ray and lab services. It retrieves updates twice per minute to ensure that the information is accurate and timely. The mobile app was created in multiple platforms to be available for iPhone and Android users.